Someone turned 4 last week!!! And had his heart set on a Batman themed birthday party. 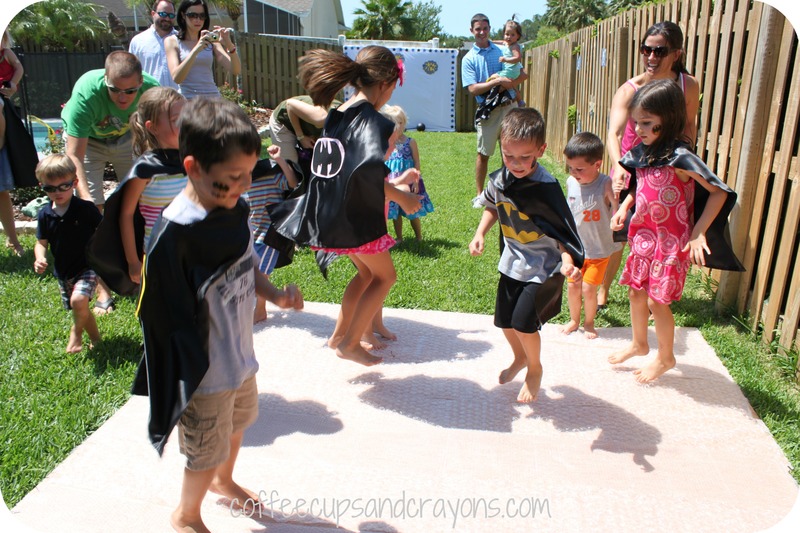 So, we ordered some cool Batman capes from Sew Plain Jane and invited his friends and cousins over to have some fun! At the last minute I made the girls Batman shirts using Heat and Bond and some polka dot material. The birthday boy is, of course, already well stocked in the superhero shirt department! We had a bounce house and Batman tattoos for the kids to enjoy as they arrived. Then once all of the guests got there we passed out the capes and got ready for some superhero training! The first stop was the Super Strength area. To be a real bat friend the kids had to show us how super strong they were by lifting the dumbbell. They also did their best superhero pose in front of the awesome photo backdrop that my friend Elaine made for me. She came over to help me with it and ended up doing the whole thing–a super friend for sure! The backdrop is just a white sheet tacked to the fence with card stock signs and stars taped to it with double-sided tape. Elaine cut everything out on her Cricut using the Cricut Plantin SchoolBook font on the roly poly setting and I love the way it turned out! To make the dumbbell my husband stuck a dowel into the middle of two foam soccer balls from Target (he made an X with a knife where the stick was going to go to make it easier to push in.) Then he spray painted the whole thing black and we had a super easy and cheap dumbbell for our little superheros! Next up was the Splash the Villian task. It is hot and humid here in FL and I wanted to make sure to work some water fun into the party to help cool things off. For this game the kids threw water balloons at all of the Batman villians I had laminated and stapled to the fence. Once all of the villians had gotten wet their task was completed! The last training activity was Sound like a Superhero. I got the idea from one of my favorite blogs, Critters and Crayons, who threw an awesome superhero themed party for her son. She rolled out 100 square feet of bubble wrap for the kids to run and jump on to make Pop! Pow! and Bam! superhero sounds. Such a fantastic idea! We didn’t have a long path to play on so we wrapped plywood with the bubble wrap and let the kids go crazy. They had a BLAST making superhero sounds! 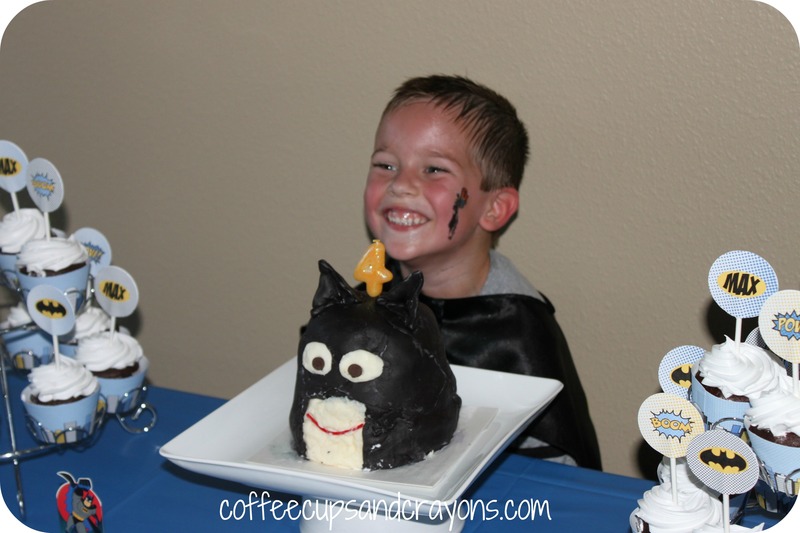 FYI: If you are planning a superhero party you must check out all the cool superhero desserts and party ideas on her blog! Once the little bat friends had completed their training they got a call on the bat phone! Batman and Robin were frozen by Mr. Freeze and the new superheroes needed to save them. But before they could reach them they had to make it over the beam and through the noodle forrest. Luckily the bat friends were professionals and were able to use the water squirters to save the day! I saw the frozen Batman and Robin idea on Green Jello and immediately knew we had to try it! I see this becoming a fun summer staple! After all that hard work the superheroes needed some refreshments. We served super “hero” sandwiches, aka subs, and chips and fruit. Simple and easy. 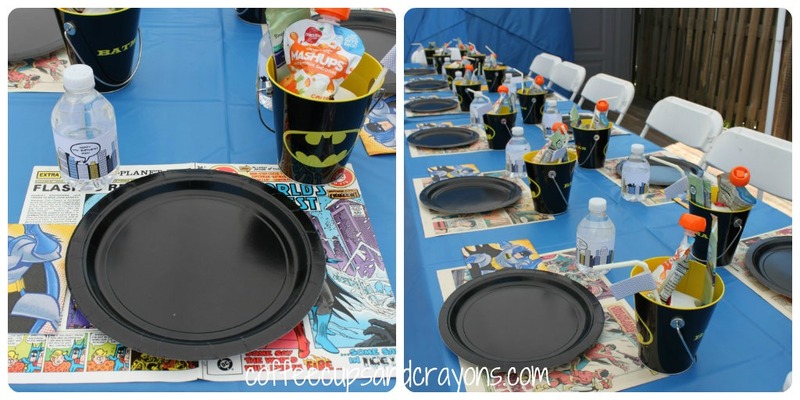 The kids’ placemats were comic book pages and the sides were served in Batman buckets we found on clearance in the dollar section at Target. 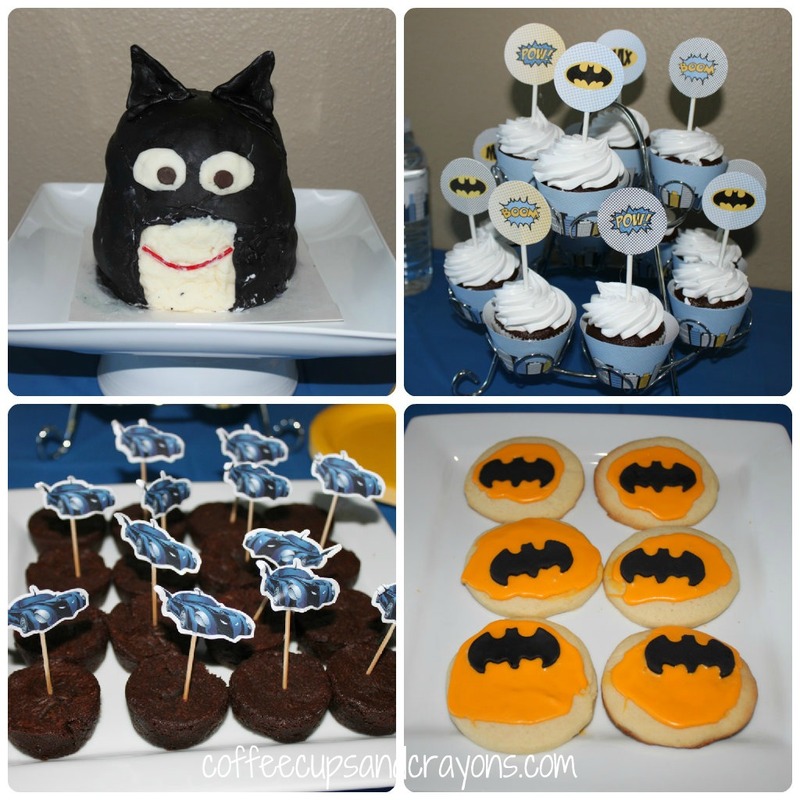 I ordered Batman printables for the cake table from Anders Ruff and loved how they turned out! I made my own cake (which is obvious in the close up shot!) and cookies and bought the rest from SuperTarget. You know the party was a success when you get this kind of smile at cake time! Found this one in the spam folder! Thanks again! Superheroes is such a fun theme! I have a feeling we are going to be redoing the frozen super friends all summer! What an adorable party! It makes me wish that I was there too. 🙂 Visiting from SITS! It was lots of fun! Which was a good thing bc it was super hot that day. Thanks for much for stopping by!!! hmmm…I could have sworn I left a comment! It doesn’t seem to have shown up! I love your party, Megan!!!! That batcake is the best! Homemade cakes are just perfect! Thank you so much for the mention but I have to tell you that I am so impressed with the crazy cool ideas you came up with! 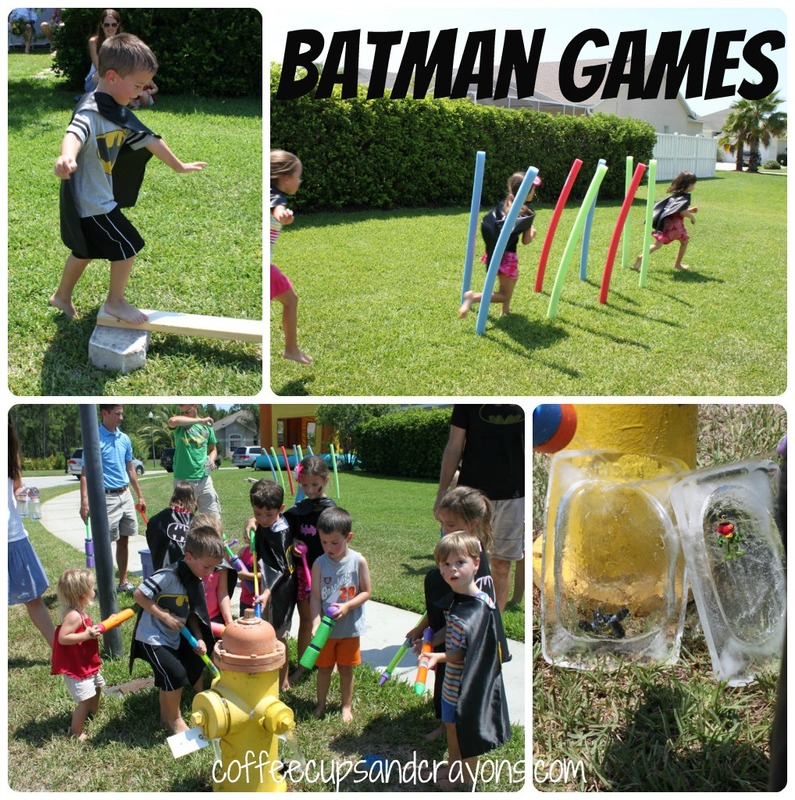 The melted ice super hero blocks and the noodle run! So cool!!!!!!! Ha! Thanks! It didn’t look anything like what I had in my mind, but the bday boy was super excited about it so I was thrilled. The hit of the party though was that bubble wrap! Seriously ingenious! Thanks for the inspiration! Thanks Asmita! He had a TON of fun!!! Such a cute party! That bat cake is adorable! Thanks Creative Printables! The cake did not turn out how I pictured it in my head but my son adored it so I was happy!!! Love this entire party! 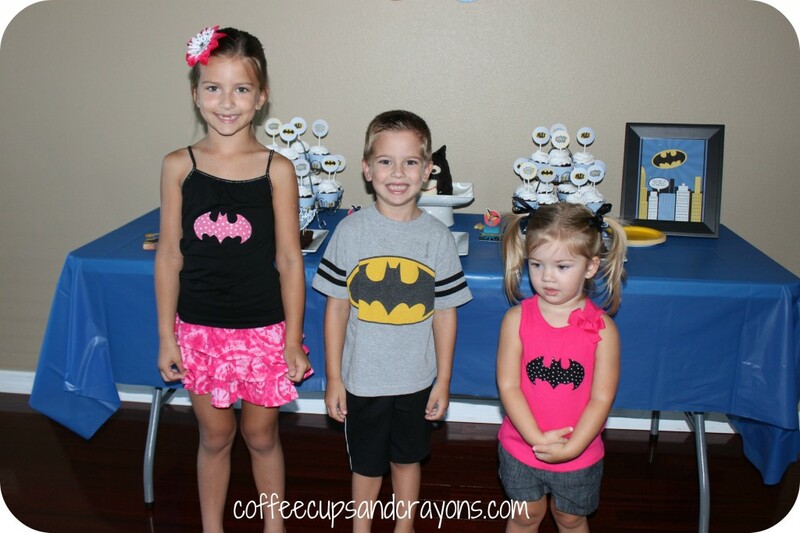 My niece is turning four and wants a batgirl party and I will be stealing some of these ideas! Just wondering how you got the noodles in the ground?? This may sound super weird, but do you know those jumbo pencils? The huge ones? Well they had a bunch of them at the Dollar Store so we stuck them in the ground and put the noodles on top of them. You could probably use small pieces of PVC piping too. Have a fun party!!!! Hi! I love your ideas and I will be adding many to my son’s 4th bday. I was wondering where you found the comic placemat paper. Thanks! Hi Erin! I just bought Batman comic books at a local comic book store and took them apart to use as the placemats! My nephew will be turning nine in September. He has been in Georgia for the past five years and has not had a party to my recollection. He wants one this year. He loves Batman, some of the ideas that you have here are going to be a hit and a big surprise for someone special. Yay!!! It sounds like it is going to be an extra special celebration! Thanks Tammy! I am sure it will be a hit!! !